Steaks. Just mention this word and the first thought that come to mind is the expensiveness. Even more if you are going for quality cuts from prime beef. 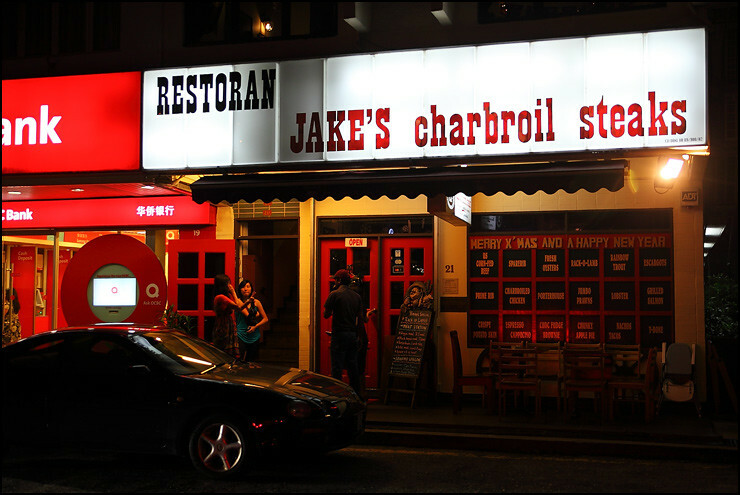 Luckily for me I have discovered Jake’s Charbroil Steaks, an affordable steakhouse located at Medan Damansara to satisfy my strong craving for steaks. If you didn’t know, Jake’s is also often referred as “the nice steakhouse along Sprint highway”. Anyway, it certainly would not cost a bomb to dine here (think Prime) but you are sure to get the same level of satisfaction. Three types of breeds are available at Jake’s namely Wagyu, Black Angus and Australian Grain Fed, while the selection of cuts is typical of any steakhouse. The T-Bone/Porterhouse menu caught my attention immediately with a number of abbreviations like K, SK and SSK. Well, you guessed them right. They stand for King (K), Super King (SK) and SSK (Super Super King) sizes, used to describe the portion of steaks you are about to receive (subject to availability though). Even the smallest T-Bone/Porterhouse weighs at 380gm, including the bone of course. You wouldn’t think I would settle just for the normal version right? But since they were out on the SK Porterhouse, I had to settle for the Australian Grain-Fed Porterhouse (K) @ 430gm @ medium rare @ RM59. I was really pleased with the portion of the Porterhouse when it arrived, I knew I would be in steak heaven. Jake’s claims to serve ‘honest’ meat, which means their steaks have little marinade. This isn’t exactly a good or bad thing because it all boils down to your own preference. 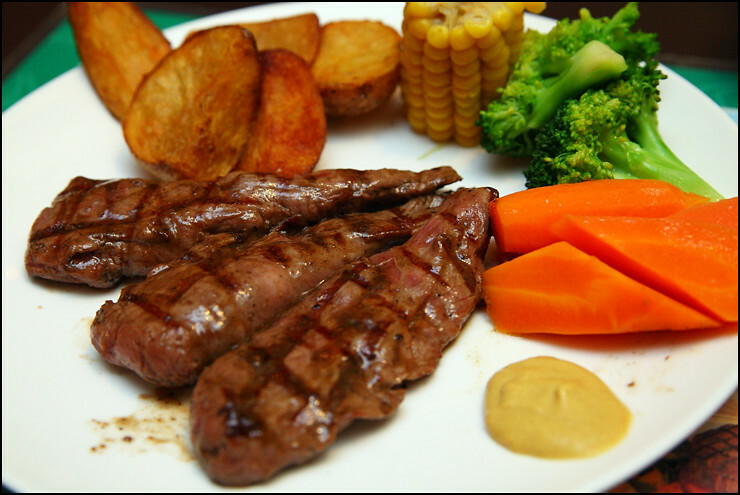 A perfectly marinated steak would have its flavor and texture enhanced without sacrificing any of the meat’s own flavor. 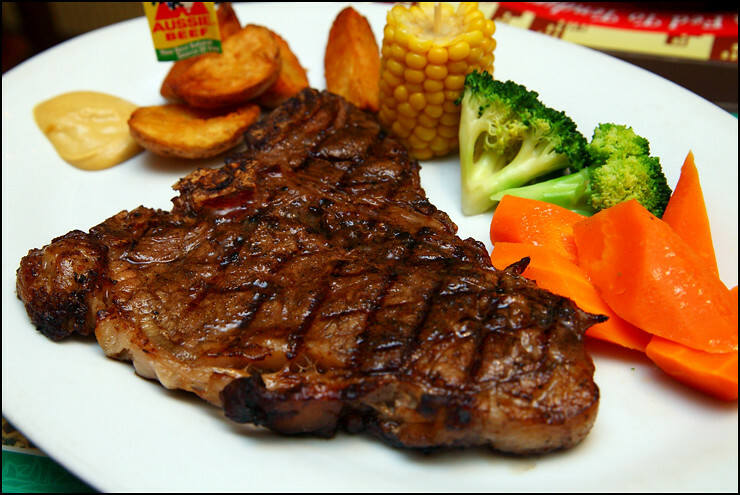 But a ‘honest’ steak also means you get to savor the meat’s natural flavor entirely without any other distracting taste. I usually have my steak just as it is, even with separated sauce. Maybe just a small grind of black pepper, that’s all. 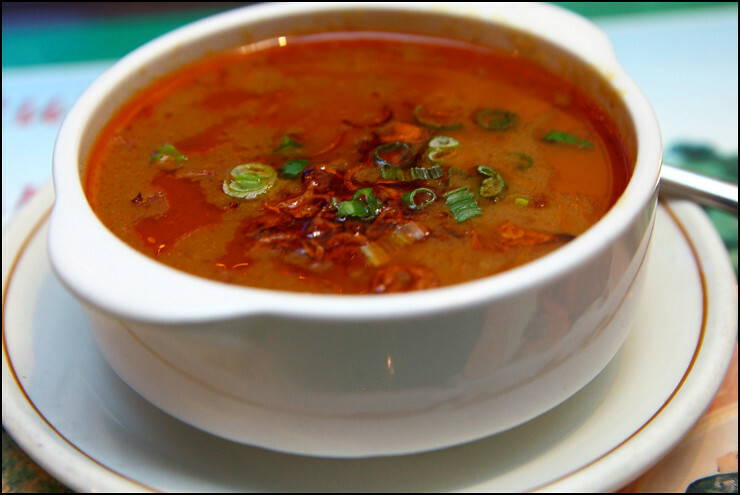 The home-cooked Oxtail Soup, also referred as The Station – Master’s Choice here @ RM10.50. It was a bit oily but I could easily overlook that because I really enjoyed the rich gravy-like texture. SL had the Australian Grain-Fed Lamb Tenderloin (200gm @ RM72), also cooked to a medium rare. 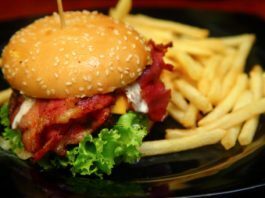 Due to their small sizes, at least two or more pieces would be served to make up for the portion. 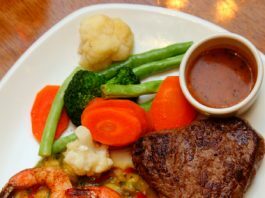 However, the Lamb Tenderloin did not taste as great as expected despite being perfectly cooked – lean without any fat yet so tender and juicy. We had a rather high expectation because a close friend actually highly recommended the lamb here. And since the lamb is grain-fed, you could expect the gaminess to be very subtle (almost non-existent) compared to grass-fed New Zealand lambs. After this heavy meal I left Jake’s a very happy and satisfied carnivore and I am already looking forward for my next meal here, maybe at their Starhill Gallery branch for a change. Now, if only they could provide sharper steak knives..